I really enjoyed building this kit. I feel that this is one of ESCI's best detailed kits, and it is also very accurate, representing the mid-series version of this vehicle. All of the distinguishing characteristics of this version are present: the armored driver's position with periscope, the hatch layout on the superstructure roof, the relocated storage bin on the left-rear fender, and the new spare wheel brackets. About the only thing that I could find missing are the pistol ports of the sides of the superstructure, and a couple of tiny lift hooks on the front and rear armored faces. 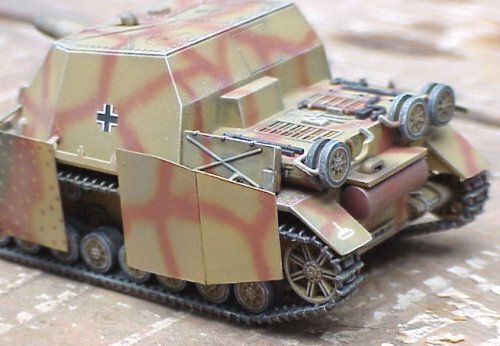 The kit uses the same lower hull and chassis as ESCI's Panzer IV kit. The idler wheels correctly represent the simplified version, but the sprocket wheels have solid spokes, where they should be split, like the idler wheels. 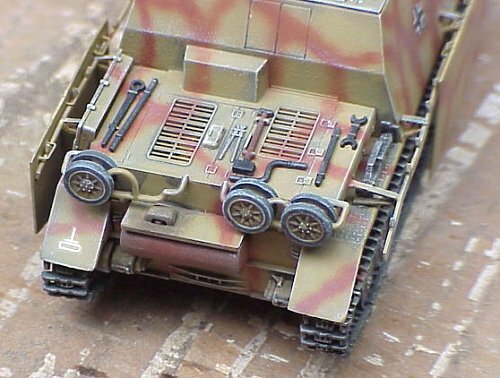 There is pretty good detail on the hull sides behind the bogie wheels, and the wheels are excellent (much better than the wheels from Hasegawa's series of Panzer IV's). The kit gives the option of open or closed commander's and loader's hatches on the roof. The gun sight can be either in the up or down position, but the sliding sight cover is molded in the open position; it would be very difficult to close it. 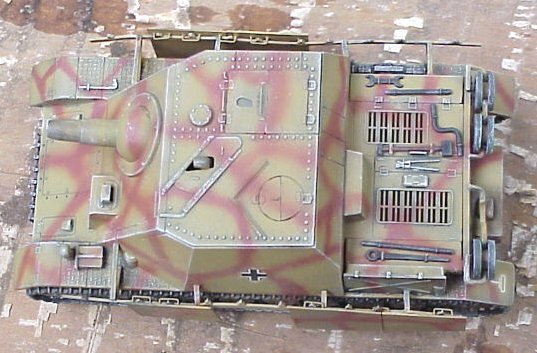 Like all ESCI kits based on the Panzer IV hull, the engine cooling vents on the rear hull sides are molded with their air flow control shutters closed. The engine deck grills are molded through the hull, and side skirts (schurzen) are provided. A couple of the pioneer tools are molded onto the engine deck, but the majority of them are separate pieces which allow you the choice of using them or leaving them off entirely. I really like that. Not enough companies give us that option. A couple of spare gas cans, and two sets of spare track segments are included. Also included are two crew figures: the same two that come with most of ESCI's German armor kits: one standing with a pair of binoculars at his chest, and the other sitting with his head to turned to the side. While the figures have pretty decent detail, I find their poses to be very flat and lifeless. Assembly of the kit was straight-forward, following the typical sequence of building the lower hull and chassis first, gluing on the tracks, then attaching the upper hull. Although I normally do not like this sequence, considering the inclusion of individual track links, it makes it far easier to attach the tracks when following the proscribed sequence. I replaced the schurzen with scratch-built copies. I made the rack from strips of styrene, and I made the plates from sheet styrene. I left off several plates, and painted one of them in a different camouflage pattern to imply hard use and lack of spare parts. 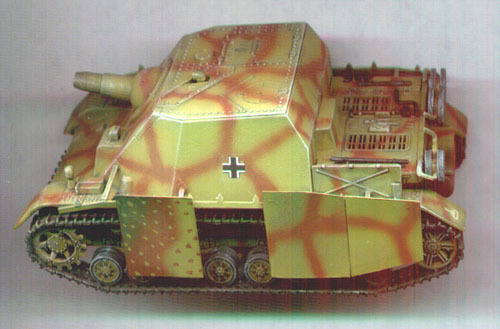 I painted the kit panzer yellow with red-brown stripes using Polly Scale paints. Once again the balkenkreuze decals were printed out of register, so I replaced them with Microscale decals. I finished with a coat of clear flat.